Eastman Kodak No. 6 was purchased new in 1946 by Kodak and it had the distinction of being the first diesel locomotive to operate on the Kodak Park Railroad, the line which served the sprawling Rochester manufacturing complex where film, cameras, and other photographic products were made. General Electric produced 80-ton switchers for nearly 30 years from 1944 through the 1970s. 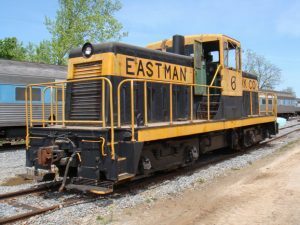 This center cab locomotive is powered by two Cummins L-6-1 diesel engines which deliver its total horsepower of 500hp. During the late 1970’s the unit saw less and less service and was placed on standby shortly prior to its donation to the museum in August 1981. The locomotive was delivered under its own power from Kodak Park all the way to Industry Depot using an all-Conrail routing through the city. As the first locomotive to arrive on our museum property, it powered our first trains as we constructed and expanded our demonstration railroad. In 1991, museum volunteers dedicated the locomotive to honor museum chairman Rand Warner. After many years of reliable service, EK 6 has been retired from regular museum operations, and is currently being evaluated for cosmetic restoration.